Freebies for military families are just one way many manufacturers and retailers strive to thank you for your service, and the place to go to find these special deals is MyMilitarySavings.com. 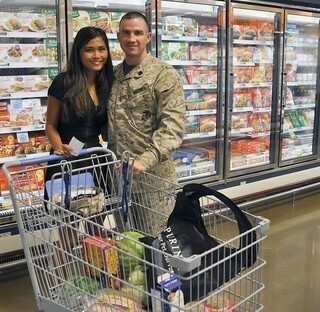 Since 2011, we’ve been the source for commissary, retailer, and manufacturer coupons, as well as other discounts offered exclusively to the military community. We work hard to find the best deals on the products and services you want and make it easy for you to find them all in one place. You can enter manufacturer contests for the opportunity to receive free gifts and prizes. You can win free Commissary gift cards when you play games like MMS Scavenger Hunt. You can receive a free membership to TicketClub.com, where you can purchase tickets to high-profile concerts, sporting events, and performing arts events at reduced prices. You’ll find numerous discounts offered by retailers for everything from fragrances to automobile purchases to vacations. But great deals and special promotions aren’t the only benefits you’ll discover when you join MyMilitarySavings.com, you’ll also find an online community of like-minded individuals who understand the special challenges faced by all who dedicate their lives to serving our country. You’ll connect with active-duty and retired personnel, military spouses, and others who share experiences, discussion, and delicious recipes. You can even join our active Facebook and Pinterest community pages for more opportunities to connect. To learn more about freebies for military families, join MyMilitarySavings.com today on our sign-up page and connect with thousands of families who serve, save, and enjoy.